Rebelscum.com: Classic Kenner Prices Hit A New Record Breaking High! Classic Kenner Prices Hit A New Record Breaking High! Auctioneers Hake's Americana & Collectibles out of York, PA hosted an auction for an AFA archived classic Kenner Rocket Firing Boba Fett that ended yesterday, and the final bid was much higher than anyone could have guessed. Similar samples in the same condition have been valued around $40,000 USD. Note: Closing time may change based on bids. 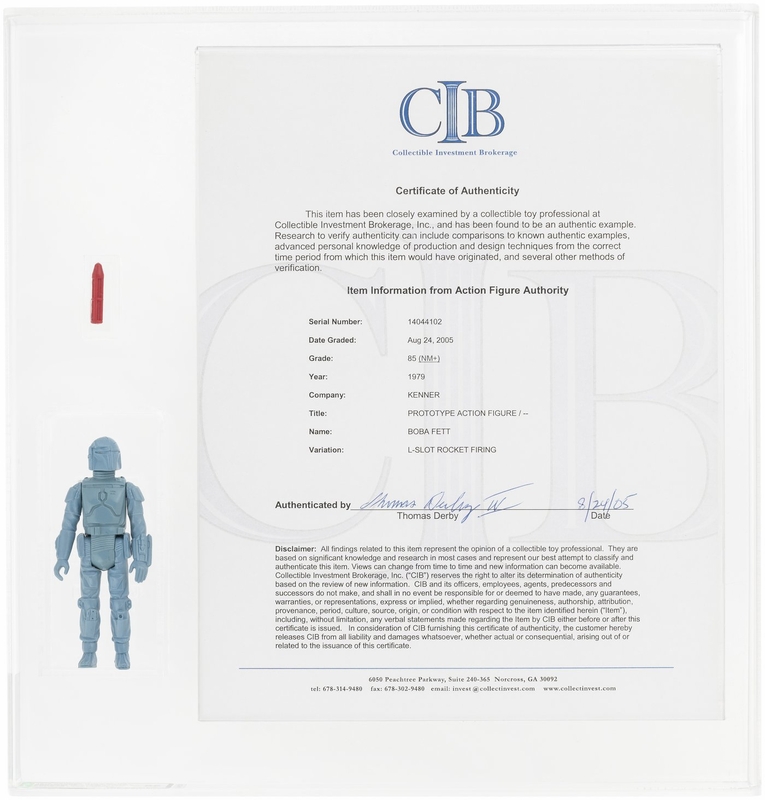 AFA graded and encapsulated 3.75" tall unpainted prototype of the infamous rocket-firing Boba Fett action figure from Kenner's popular 1979 "Star Wars" toyline. AFA-graded 85 NM+ (Archival case). Custom case displays prototype figure and rocket separately and L-slot rocket-firing mechanism is clearly visible from the back of case (spring clearly visible). Comes with notarized Collectible Investment Brokerage LOA. Russell Branton Collection. For this listing, Hake's Americana offers a 3 month time payment plan with a 25% non-refundable deposit due within two weeks after the close of the auction. Payment methods accepted are check, money order, wire transfer, Visa, MasterCard, American Express and Discover. Regardless of the method of payment, the buyer's premium discount is not applicable for invoices utilizing this payment option. What's interesting here is how many samples are likely to exist of this figure. Most collectors in the know estimate there could be up to 80 L-Slot Rocket Firing Boba Fett action figures like this one out there, so what does that say about the value of one of a kind preproduction Kenner pieces? Granted, there isn't anything quite as popular from the vintage era, and even the casual Star Wars collect knows at least a bit of the figure's history. We've seen prices skyrocket over the last few years as a third generation of collectors, largely made up of professionals with expendable incomes, look to level the playing field in a community where most of the best Kenner stuff has already reached their forever homes, and will never be available on the open market. This new generation has put bragging rights over common sense, and we are now living in a bubble. How ridiculous will prices get before it busts? February 24, 2018 Hinky Classic Kenner Hollow Tube Tusken Raider? January 28, 2018 Zak Wins Us Over With Classic Kenner 4 Piece Glass Set! January 28, 2018 Now This Is How You Sell Your Classic Kenner Figures!